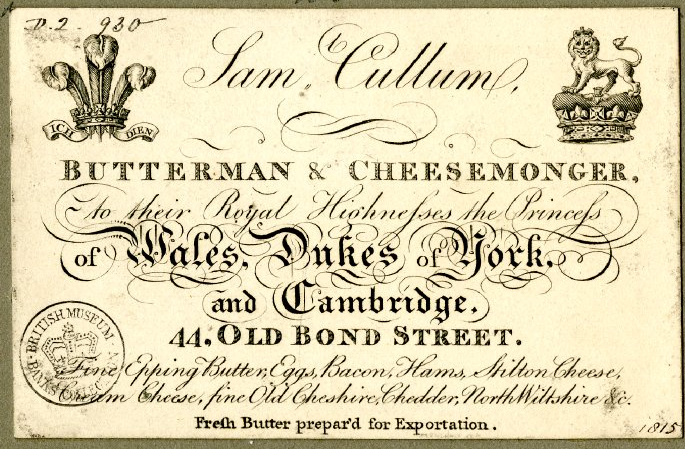 The Cullums had already been buttermen in London for quite some time. In 1775, John Cullum obtained the freedom of the City by redemption, suggesting he came from outside the City of London and had not gone through the usual 7-year apprenticeship. 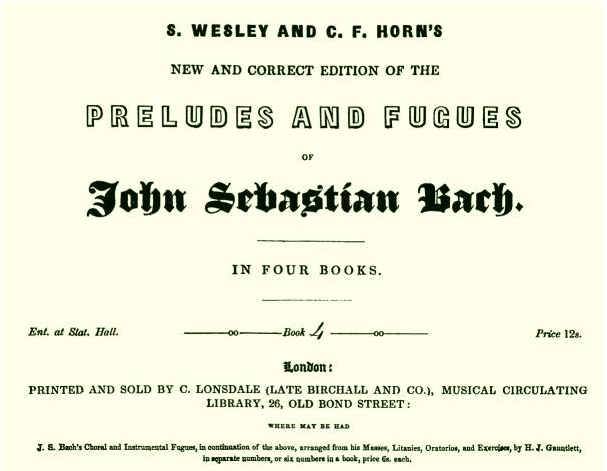 In 1787 and 1789 respectively, he takes on his own sons Stephen and George as apprentices. Their address is then given as Clare Market where the family worked together, but in 1810, George decides to go it alone in Old Bond Street. Later that same year, he writes his will, leaving everything to his wife Mary Ann. (3) He died in early April 1814 and his burial record gives him as of Devonshire, late of Bond Street, although he was buried at Heston, Hounslow. 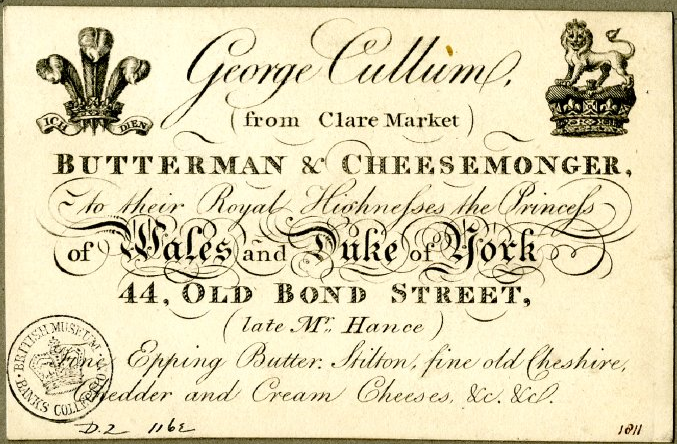 The next instalment in the Cullum occupation of the cheesemonger’s shop in Old Bond Street can be deduced from another trade card and the Land Tax records. The business was continued after the death of George by Samuel Cullum, most likely George and Stephen’s brother who – I think – may also have had a shop in Newgate Street, although there were more Samuels in the family. Please note that besides the butter and cheese George sold, Sam is also advertising eggs, bacon and ham. I think Samuel retired in the early 1830s, although there is a suggestion that he, with a Charles Whitfield, was involved in the Paxton & Whitfield business, now in Jermyn Street, but the information that firm gives on its website does not quite match the information I have, as they have Sam as the son of a Stephen (an earlier generation than John’s son Stephen). I will come back to that puzzle when I have worked it out. Sam Cullum is still mentioned for 44 Old Bond Street in Kent’s 1823 Directory, and is listed in the Land Tax records for 1830, but in 1831 William Whitfield is paying the tax. An 1834 insurance record also mentions William Whitfield, although Cullum and Whitfield probably traded together in the early 1830s, as their servant, William Holmes, described both Cullum and Whitfield as his employers when he gave evidence in 1831 in a case of stolen butter.(4). William had already been a cheesemonger before he took over from Cullum as he is mentioned as such in the baptism records for his children (the oldest was born in 1821). The Whitfield family lived in East Street while William worked in partnership with his half-brother John at 16 Lamb’s Conduit Street (Kent’s Directory of 1823), before moving to Old Bond Street to work for Cullum and then taking over the business. William Whitfield was born in 1786 in Startforth, Teesdale as the son of John Whitfield and Elizabeth Pinckney. In April 1819, he married Jane Barbara Benning, daughter of Jane and James Benning, surgeon, at Staindrop, Durham. (5) Jane Barbara was the sister of William Benning the bookseller at 43 Fleet Street who married Alice Whitfield, William Whitfield’s sister and John Whitfield’s half-sister. (6) Two of William and Jane Barbara’s sons were given the additional first name Benning: William Benning Whitfield (1821-1841), and James Benning Whitfield (1825-1881). The couple were to have eight sons, six of whom survived into adulthood. 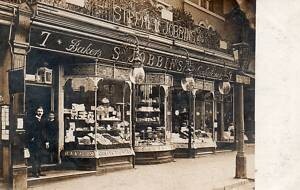 (7) By 1831, when son Septimus was baptised, the Whitfields had moved to 44 Old Bond Street. Only three children are listed in the 1841 census: George, James and Octavius; perhaps the others were at school or visiting somewhere. The 1851 census also shows three children: James Benning, a solicitor, John, a clerk and Octavius who was still at school. The 1851 Post Office Directory, however, lists the business as William Whitfield & Son, so at least one of the absent sons must have been involved in the cheese and butter business. William Whitfield died in 1859, 73 years old, and was buried at All Souls, Kensal Green, on 7 September 1859. In the probate entry his address is given as 18 Hereford Square, Brompton, and Old Bond Street, although he seems to have died in Drummond Street, Euston Square. His widow Jane Barbara was the sole executor. (8) Jane died in February 1861 and the executors of her estate were sons George of 167 New Bond Street, and James Benning of 1 Mitre Court Temple. (9) Two other sons, Septimus, silk merchant, and Octavius, solicitor, both unmarried, were living in Great Portland Street at the time of the 1861 census, but the cheese business at 44 Old Bond Street remained in the family, as in 1862, John Whitfield of Messrs. Whitfield gave evidence in a court case where the basket of Whitfield’s porter had been emptied of a roll of butter when the basket had been temporarily left on the railings of a house. (10) Who the other half of Messrs. Whitfield was, remained unsaid, but it was most likely George. On 2 February 1873, a small notice in Lloyd’s Weekly Newspaper spoke of a “destructive fire” that had occurred on Sunday morning on the premises of W. Whitfield, 44 Old Bond Street. No more information is given, but at least it tells us that the Whitfield shop was still in business. A year later, the Westminster Polling District records show that it were just Charles and Octavius that were still having an interest in the freehold. James Benning’s name has been struck out and Septimus was dead by then. I am afraid that from now on, we will see the brothers dying one by one, resulting in a long list of probate records. In 1878, the probate records tell us that it was indeed George who had been the other partner in the business at number 44, as he is listed as having been a cheesemonger at that address, although he lived at 28 Nottingham Place. (13) The next brother to die was James Benning who lived at 97 London Road, St. Leonard’s, Sussex. He died in August 1881. (14) Probate was granted to his brother Charles, “the surviving executor”. Charles was then living at 18 Jermyn Street, the same address as the Paxton & Whitfield shop at that time, so I think we can conclude that it was indeed Charles who was involved in the Paxton & Whitfield business, although he cannot have been the Charles who entered the business in 1790 as he was not even born then. That, with the inconsistency in the Cullum partner, means there is more work to be done to solve the Paxton puzzle. Charles died in 1882 and turned out to have been the best businessman as he left the largest estate. (15) And to round off the list of probates, the last one is for Octavius who died in November 1885 in Italy.(16). And the shop itself? George was the last of the Whitfield brothers to actually work in the cheese and butter business in Old Bond Street and I have not found any more cheesemongers there, so I think the shop was sold outside the family. In 1906 a new building was erected for Glyn & Co, hatters, and a recent owner decided to paint it a horrible pink and the Whitfields would certainly no longer recognise the building, so best to leave the story with the death of the last Whitfield brother and forget about the later history of the premises. (1) The London Gazette, 24 April 1810. (2) The Morning Chronicle, 4 May 1810. (4) Old Bailey case t18310908-211. 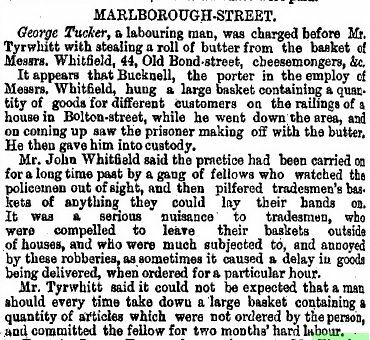 Butter was stolen from the servant’s basket when he had left the basket when he went into a property to deliver goods. (5) The will of James Benning is transcribed on the Will Transcriptions Website here. (6) Information supplied by Catherine Ryan and Nicky Carter, for which grateful thanks. (7) I found the following baptisms: William Benning 29 July 1821, died Jan 1841; George 12 Sep 1823; James Benning 9 Feb 1825; Charles 22 Sep 1826; John 18 Sep 1829; Henry 5 May 1830, died Sep 1833; Septimus Augustus 2 December 1831; Octavius 1838? (8) England & Wales, National Probate Calendar (Index of Wills and Administrations), 1859. The estate was valued at under £25,000. (9) England & Wales, National Probate Calendar (Index of Wills and Administrations), 1861. The estate was valued at under £16,000. (10) The Daily News, 10 January 1862. In fact, a similar offence to that of 1831, see footnote 4. (11) England & Wales, National Probate Calendar (Index of Wills and Administrations), 1868. The estate was valued at under £20,000 and probate was granted to his brother Octavius. (12) England & Wales, National Probate Calendar (Index of Wills and Administrations), 1866. The estate was valued at under £3,000 and probate was granted to his widow Jane Rebecca. (13) England & Wales, National Probate Calendar (Index of Wills and Administrations), 1878. The estate was valued at under £16,000 and probate was granted to his widow Hester. (14) England & Wales, National Probate Calendar (Index of Wills and Administrations), 1881. The estate was valued at over £2,200. (15) England & Wales, National Probate Calendar (Index of Wills and Administrations), 1881. The estate was valued at over £155,000 (resworn in 1883 at £163,445) and probate was granted to his nephew William Henry, solicitor. (16) England & Wales, National Probate Calendar (Index of Wills and Administrations), 1885. The estate was valued at over £60,000 and probate was granted to his nephew William Henry as the sole executor. 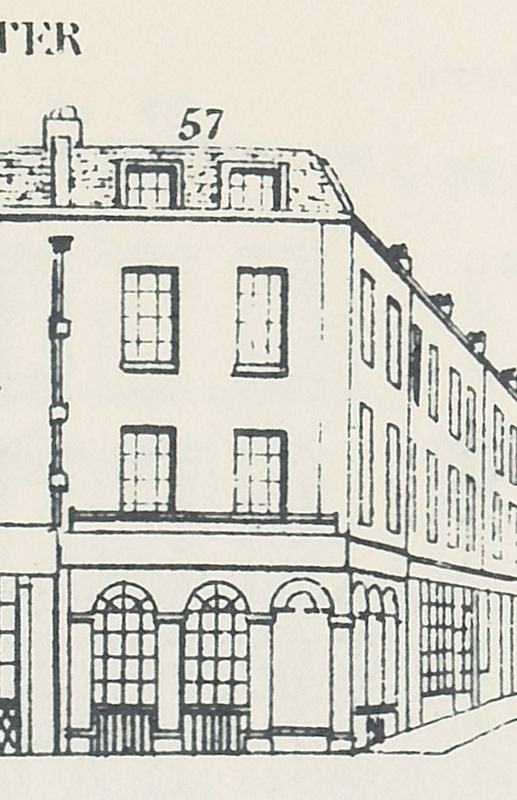 23 New Bond Street was used by several businessmen: Richard James Culverwell had his bathing establishment there, but Tallis also lists James Cooper, a tailor, Thomas Ince, a wine merchant, and G.H. 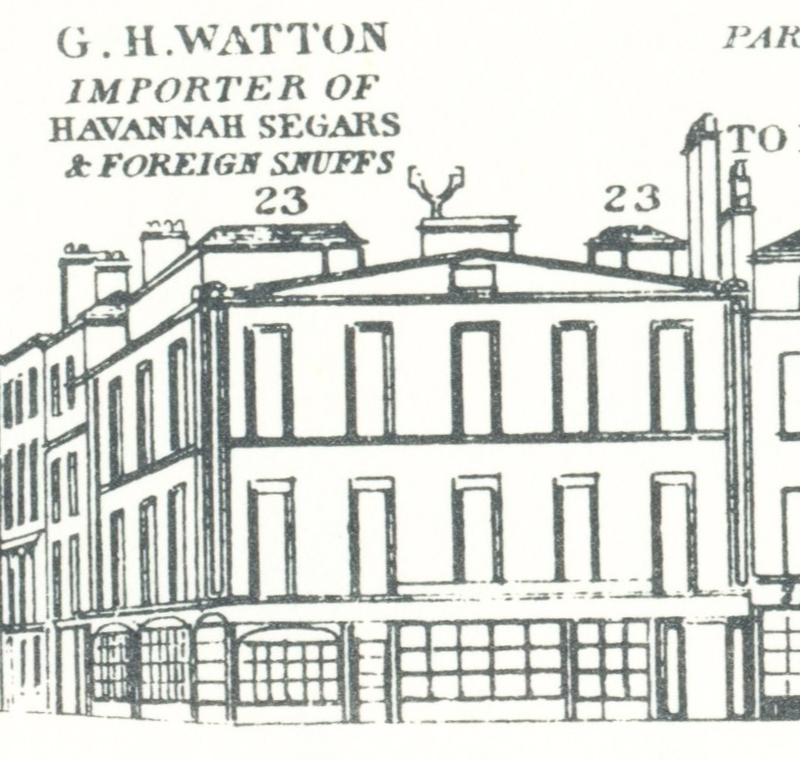 Watton, tobacconist “Importer of Havannah Segars & Foreign Snuffs”. As you can see from the elevation at the top of this post, it was rather a large building which easily accommodated all these various businesses. Watton had apparently the most money as he had his name engraved above the building, but that is not to say that his shop was the largest; we do not know. The building was situated on the corner of New Bond Street and Conduit Street where today you can find the even larger building of Burberry’s. Culverwell wrote an autobiography, The Life of Doctor Culverwell, written by himself: being Curiosities of Thirty-Five Years’ Medical Experience, Embodied in the Biography of the Author (1850? ), but unfortunately for us, Culverwell’s account is rather verbose, not to mention the fact that he refers to himself as ‘we’, because “it appears less gratingly egoistical”, so you never know whether he means ‘I’ or indeed ‘we’. All this does not make for easy reading. And the ‘facts’ about his life with which he interspersed the account of his medical cases may not be reliable, but I will draw upon them from time to time as they do fill in the gaps between the real facts elicited from dry archival records. Culverwell says that he was born on 13 July 1802 and that his father was a merchant. The date is born out by his baptismal record at St. Sepulchre, London, which gives the same date for his birth when young Richard James was baptised there on 8 August 1802 as the son of Richard James senior and Mary Ann Culverwell. Richard junior became an apprentice apothecary and he received his Licentiate degree in November 1824 at Apothecaries’ Hall after which he could legally start his own career. A year earlier, in November 1823, he had married Ann Eliza Mansell at St. Maylebone and after Richard’s exams, they proceeded to set up their own medical business. Richard typically does not give us the exact address, although later on he mentions living at number 3, but it was “on the borders of a bustling suburb of the north of London, in a newly-built residence” and his account of the preparations to open the shop are a good example of his style of writing. The old custom for the draper, druggist, and other dealers, was to emblazon in shaded characters, black and white, gold and green, or any motley antagonism, as we see now in our palatial hotels, and other monster establishments. Accordingly, ciphered in due form over a broad front with a couple of transparent paintings in two central windows, one representing the hieroglyphic emblem of a rhinoceros, with “Chemicals from Apothecaries’ Hall” and another notifying the popular attractive fact that advice was to be had at certain hours for nothing, a card on our counter, and a conspicuous lamp, showing its refulgence a mile off, over our door, threw we open our “Medical Hall” to the admiring curious of the neighbourhood. We may not know the address where he sat himself up in 1825, but we do know that he lived in St. John Square when his daughter Ann Eliza was baptised on 26 August 1824 at St. James, Camberwell. His profession is then given as surgeon. When his next child is baptised, Georgina Phillis, on 4 June 1826, the family’s address is Lower Road (now Lower Street), Islington. They were still there when the third daughter, Harriet Muriel, was baptised on 29 October 1828. We know from later records that there was at least one more daughter born to the couple, Fanny, but I have not found any baptismal record for her. Judging by the census records, she was born c. 1834. That brings me to the first census record available, that is of 1841, when the family are residing at Grove Place. 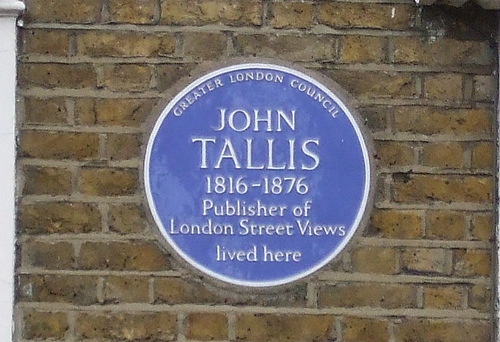 By then of course, the baths were well established in New Bond Street as Tallis’s Street View testifies, but before that the Culverwell baths were to be found at Founders Court, Lothbury. 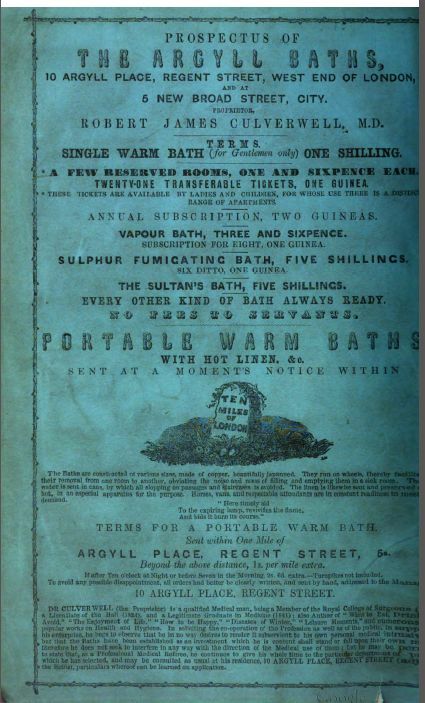 An advertisement in The Examiner of 14 March 1830 announces “Culverwell’s shampooing, sulphur, Harrowgate, medicated, vapour and warm baths”. A warm bath would cost you 2s. 6d. According to Richard’s autobiography, the idea of providing hot baths emerged when he still lived and worked in the suburbs (presumably at the Islington address) when a rich patient used a large copper cauldron at the surgery for the hot baths he had been advised by a physician, rather than going up to London to have a good soak. Word got out and hot baths turned out to be more profitable than bottles of physic. The Culverwells had a wooden bath lined with lead constructed in a separate room, but it caused severe disruption to family life as a waiting room had to be arranged in the parlour. One day, the demand for hot water was so great that the chimney caught fire. The coach house at the back of the house was subsequently converted into several bath rooms where vapor, sulphur and warm baths could be had. The drawback was that customers had to go through the house and garden to get to the baths and in winter everything got mouldy and damp. With a neighbour(1), Richard then planned to open a bathing establishment in London and as the neighbour went there every day for his work, he was to find suitable premises, which he eventually did in Founders Court. Culverwell claims to have had twelve rooms with baths in each of them, and in some of the larger rooms, they had vapour, hot air and sulpher baths. 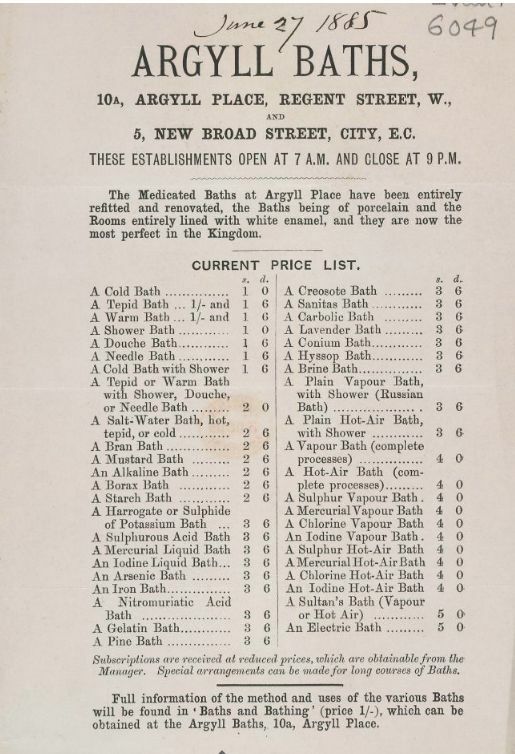 The prices were adapted to London standards and a hot bath was now 3s. 6d., later reduced to 2s. 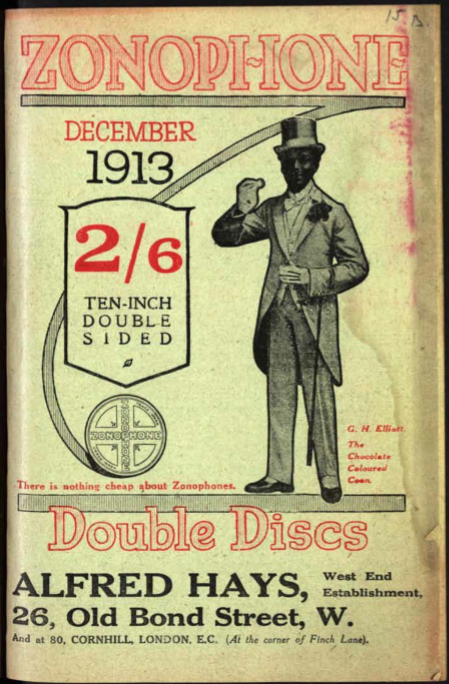 Culverwell branched out into writing books about medical subjects, not so much because money was to be made from the books themselves, but because they could be used to draw in the customers. Some of his publications have several pages at the back eulogising about the baths and itemising his growing list of publicatons. And it worked; business was going well and thoughts of expansion entered Culverwell’s mind. One day, “in a West End ramble our eye caught some premises to let, at 23 New Bond street”. And so Culverwell moved his family to Bond Street and attended to his customers at Founders Court in the morning and to Bond Street in the afternoon, but “the West End Establishment was not successful or satisfactory as a locality for practice. After enduring many discomforts, we sold it for less than half of the original outlay”. And so the baths moved again, this time to 5 Broad Street. Culverwell does not provide years for the several moves, but from advertisements and other sources, we can deduce that the move from New Bond Street came about fairly soon after the Tallis Street Views were published, as an advertisement in his Medical Counsellings; or, The Green Book of 1841 already gives the Broad Street address. 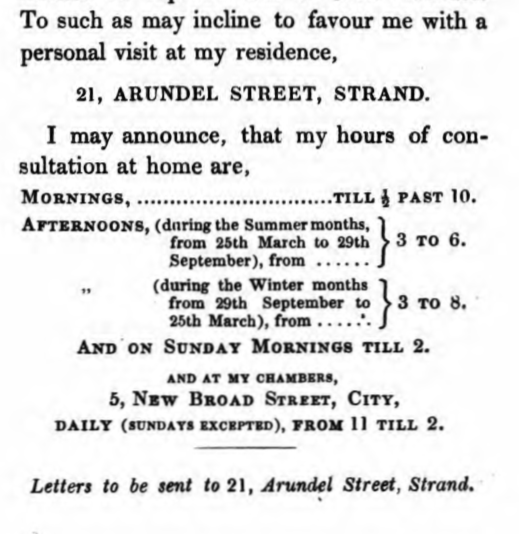 An advertisement in his Illustrated Domestic Handbook for Invalids of 1843 tells us that he had moved his family and doctor’s practice to 21 Arundell Street, Strand, while maintaining the baths at Broad Street. Richard had by then acquired his medical degree on the Continent which, according to him, was a lot cheaper than trying to obtain the degree from the College of Physicians. And then came the last move and finally Culverwell gives us a date “On the 8th of August, 1846, we removed to Argyll Place”. And there they stayed. In December 1852, Richard died, but the business was continued by the widow. The 1861 census shows her as the “owner of public baths”, living with daughter Fanny at 10 Argyll Place. Ann Eliza died in December 1863, but the baths remained in Argyll Place for many years to come. (1) The neighbour is just referred to as Tom in the autobiography, but two notices in the London Gazette (2 November 1830 and 8 May 1838) tell us that his name was Thomas Cooke. According to booklet 7 of the Tallis Street Views, 165 New Bond Street was shared between John Barnes, a wig maker and hair cutter and Thomas Warne, antigropelo manufacturer. Pardon? Antigropelo? Yes, exactly my thoughts when I read Warne’s occupation in the Street View directory, so I looked it up in the Oxford English Dictionary and it turns out to be a combination of the prefix ‘anti’ and the Greek ὑγρός (ygrós = wet) and πηλός (pi̱lós = mud). The OED gives the word as antigropelos with an s at the end which is the more common (and probably linguistically correct) form. 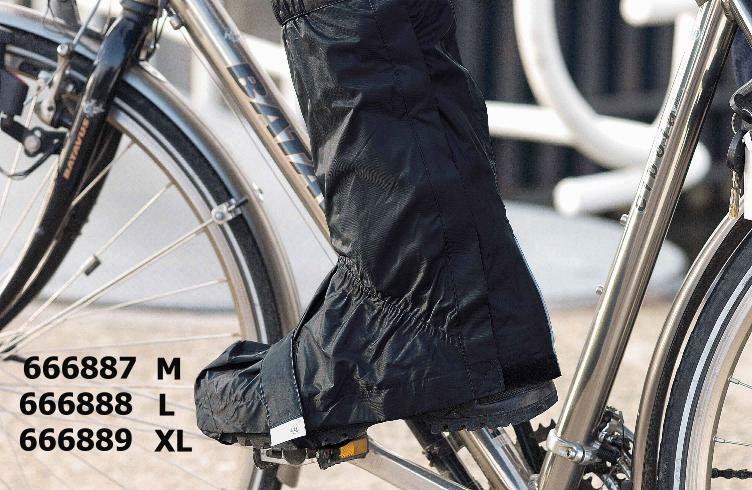 The explanation for the word reads: ‘Coverings to protect the legs against wet mud; waterproof leggings. (Originally, a proprietary name)’. And to be comprehensive, the explanation for ‘legging’ is ‘A pair of extra outer coverings (usually of leather or cloth), used as a protection for the legs in bad weather, and commonly reaching from the ankle to the knee, but sometimes higher’. And the National Standard Encyclopedia of 1888 has a nice synonym for them: spatter-dashes, although we call them more prosaically ‘rain leggings’ these days. 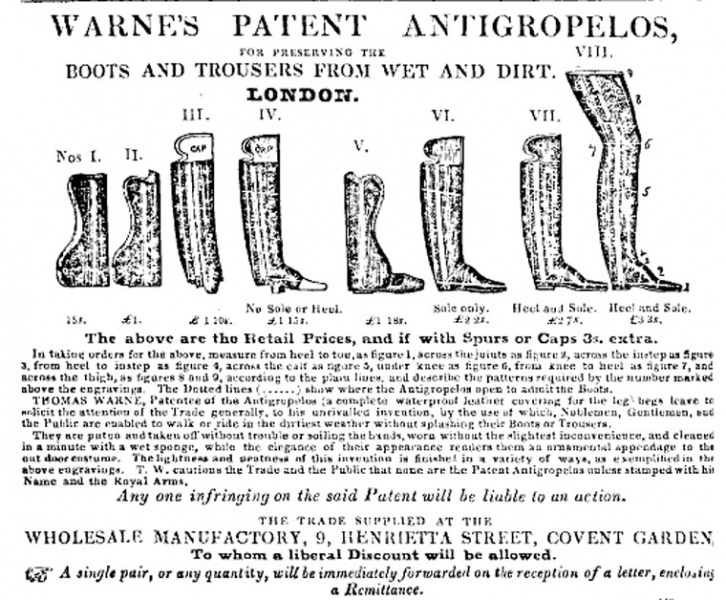 The first reference I found for Warne’s antigropelos is in an advert in the Newcastle Courant of 3 December, 1836 in which “Thomas Warne, patentee of the antigropelos, begs leave to solicit the attention of noblemen and gentlemen, to his unrivalled invention, by the use of which they are enabled to walk or ride in the dirtiest weather, without soiling their boots or trowsers [sic.]”. Why the advert is in the Newcastle newspaper while Warne is based in London becomes clear further on in the advert when John Newton, a saddler in Newcastle, is introduced as the sole agent for that town. Warne had more ‘sole agents’ in various towns around the country, such as in Bristol, Leicester, Norwich and Southampton. He was on to a good thing and as these things go, the competition tried to get their share of the pickings and Warne had to issue warnings and even go to court to stop the infringement of his patent. In 1843, The Mechanics’ Magazine reported on the breach of an injunction against using the name antigropelos when one Peter Golding tried to get away with it by calling the leggings he sold ‘antimudropelos’. The Vice-Chancellor of England who had granted the injunction the month before was having none of that and Golding was told to stop. 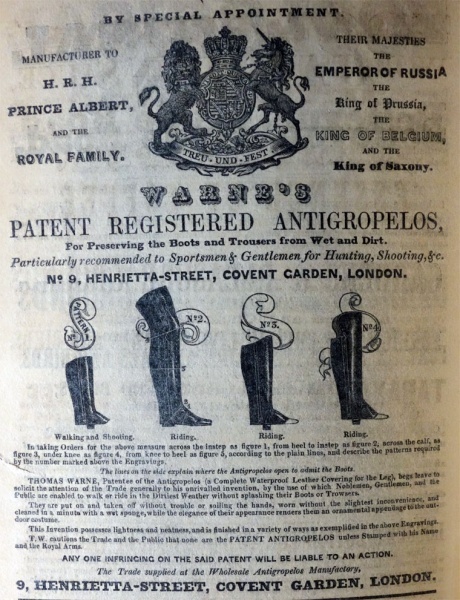 During the proceedings Warne claimed to have used the name antigropelos “for upwards of ten years to distinguish the articles of his manufacture”, so he must have invented them in 1833 or thereabouts. But it was not just competitors that Warne had to contend with. In 1844, William Northcott, Warne’s shopman, was charged with embezzling sums of money from his master(1) and in 1838 it was another employee, James Robinson, who was charged with the same offence, although he was found not guilty. 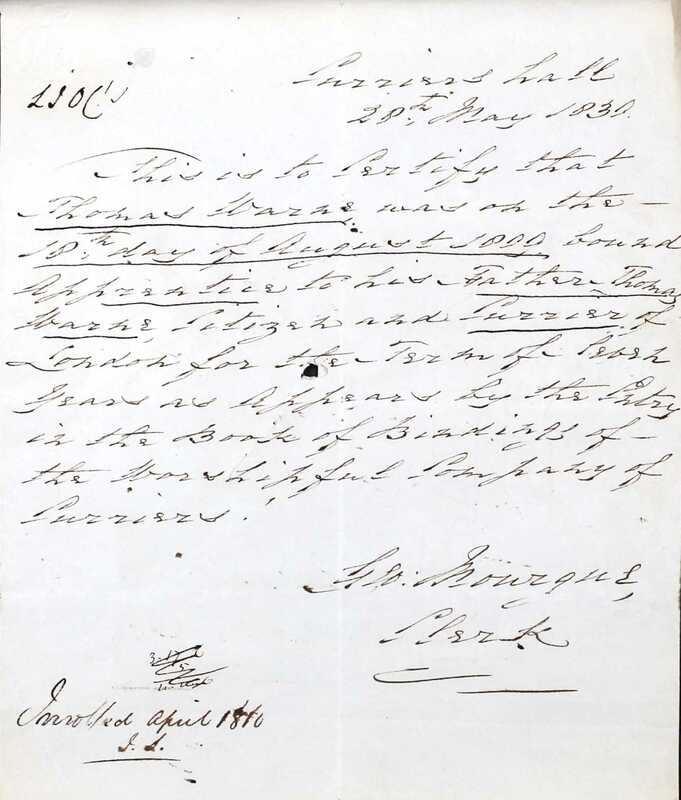 (2) There had been some disagreement over the payment Robinson made or was supposed to make to Joseph Bold on behalf of Warne for the metal springs Bold made for the antigropelos (the clerk writing down the proceedings obviously did not know what they were, or perhaps there is an error in transcription at a later date, but they are referred to as autocropolis in the proceedings of the case). What is more interesting about this case than the alleged embezzlement is the information given about Warne’s places of business. 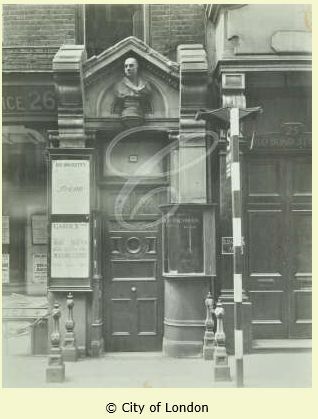 We know from the Tallis Street View that he had an outlet in Bond Street and several of his advertisements mention 9 Henrietta Street (more on that address later), but in the Old Bailey papers, 414 Strand is mentioned as the “wholesale manufactory”. Robson’s London Directory of 1842 also gives the Strand address as one of the premises for Warne, incidentally also revealing that Warne is a currier, an army and navy contractor and a wholesale boot and shoe manufacturer. 414 Strand is, however, not mentioned in the Street Views, the numbering seems to jump from 413 to 415. On closer inspection, however, it can be seen that between these two premises is a small entrance to Heathcock Court and several tax documents and electoral registers mention Thomas Warne as the occupant of a dwelling in Heathcock Court. A bit more digging produced an F. Warne, currier, who in the 1814 Post Office Directory was given the address of Heathcock Court, 414 Strand. A family relation seems likely, although I have not worked out which one exactly. 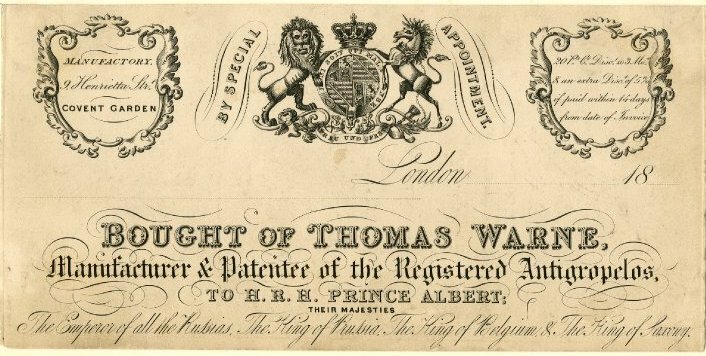 It cannot have been his father as that was also a Thomas, unless a mistake has been made and F. is really T. From 1821 onwards, I find Thomas at that address in the tax records. 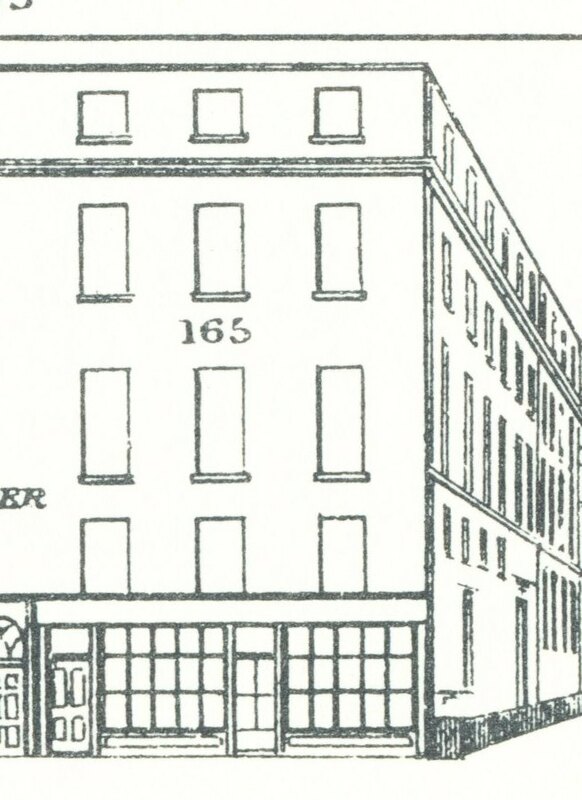 In 1829, the partnership between William and Thomas Warne, curriers at 414 Strand, is dissolved. (3) No doubt another family relation, but here again, not known which relation exactly. (1) The Morning Post, 13 May 1844. (2) Old Bailey, 22 October 1838. (4) Survey of London: volume 36: Covent Garden via British History Online (see here). (5) England & Wales, National Probate Calendar (Index of Wills and Administrations), 1864. Probate is granted 11 February. David junior continues the bakery, but a few years later, in April 1847 disaster strikes. On a Sunday morning at about eight o’clock, fire broke out in the “extensive range of premises belonging to Mr. Simpson, bread and biscuit maker”. The fire was discovered by a passer-by, but the flames had by then already taken hold of most of the lower floor. The occupants were alerted and made their way out of the building with difficulty; two of the journeymen escaped with nothing more than their night clothes. The newspaper report(2) mentions that the “fire-plugs” yielded enough water for the fire-engines to throw on the flames, or, as the newspaper phrased it: “copious streams of the antagonistic element were scattered over the flames”. Unfortunately, the firemen could not prevent the fire reaching the roof from which it spread to the neighbouring property at 58 Piccadilly, the shop of Alabaster, bonnet maker. George Frederick stayed at the Piccadilly / Bond Street premises and Edward moved out. The 1851 census shows George Frederick at the address, together with his wife Jane, sons Henry and George, his widowed mother (or mother-in-law; it is not clear as she uses a different last name) and a house servant, two shop girls and eight male bakers. In 1852, he deems it necessary to put in an advert stating that the bread made at his establishment “is warranted to be quite free from adulteration” and made with the flour provided by Mr. Dives of Battersea “whose flour was pronounced by the Analytical Commission to be quite pure”. (6) Had someone been making accusations? And while Jobbins is guaranteeing the flour he uses, he also takes the opportunity to tell his customers that his dry biscuits are warranted to remain in good condition for twelve months if kept in the boxes provided and free from damp and “boxes allowed for when returned”. Dives’ horizontal mill at Battersea, copy of an illustration in E. Walford, Old and New London, vol. 6. 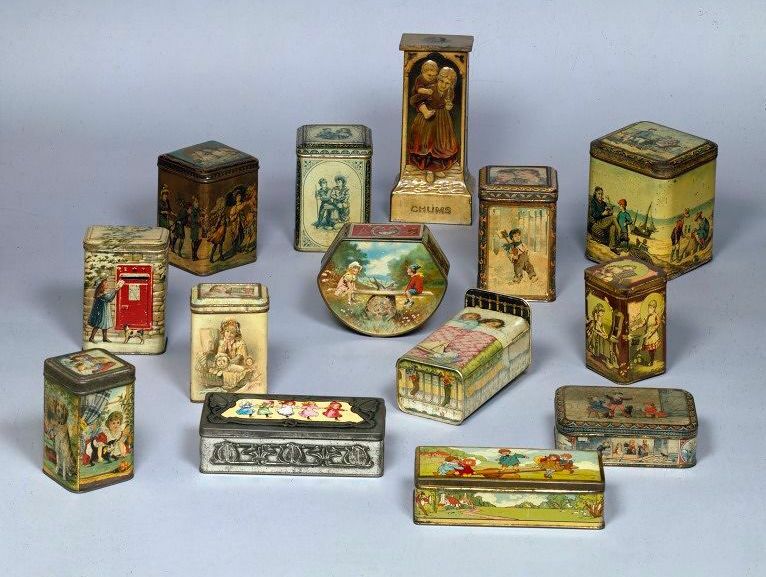 Photo credit: Wandsworth Museum via BBC Your Paintings. 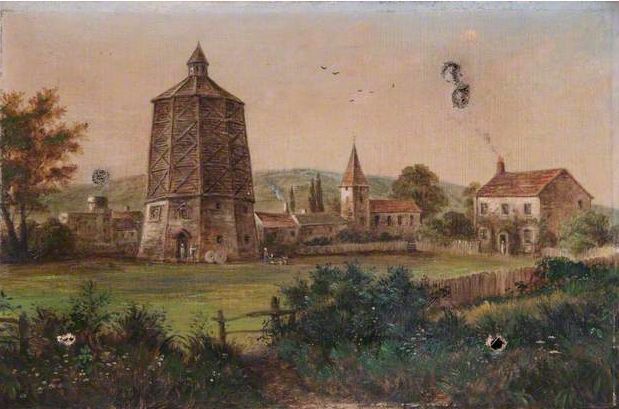 The top of the windmill had been taken down in about 1825 and the work was from then on done by a steam engine. Stephen did not stick to baking bread and biscuits. He also acted as an agent for domestic staff and started up a catering business, not just supplying the food for functions, but also the cutlery and crockery needed and the entertainment itself, from conjurors to dance orchestras. (8) In 1900, Stephen signed over the lease of Montpellier Vale to a hosier and just concentrated on his other premises at 7 and 9 Blackheath Village (then 6-7 Brunswick Place). But within a very short time, he had expanded that shop once again to include a “Luncheon and Oriental Tea Room”. Eventually he had five branches in Lewisham, Lee, Eltham and Mottingham and – as these things go – was eventually taken over by even bigger companies. (2) Northern Star, 10 April 1847. (3) The Observer, 11 April 1847. (4) He was buried 20 June 1848 at Hillingdon, just 33 years old. (5) London Gazette, 29 March 1850. (6) The Spectator, 21 February 1852. Jobbins refers to Food and the Adulterations; Comprising the Reports of the Analytical Sanitary Commission of “The Lancet” for the Years 1851 to 1854 inclusive (1855) who pronounce that Dives’ flour “does not contain alum”. (7) N. Rhind, Blackheath Village and Environs, 1790-1970, vol. 1 (1976), p. 60-61. (9) Family tree owned by chrisj60 and published at Ancestry.co.uk. Many thanks to Christina for allowing me to use the photo of the bakery. 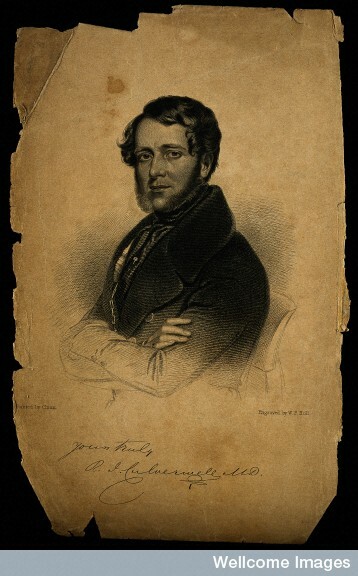 On the 29th of March, 1837, a Frenchman arrived in England through the Docks of London and the arrival certificate states that his name was Jean Baptiste Reynauld, that he was a silk mercer, a French citizen with a French passport, and that he had arrived from Boulogne on the Emerald. This was not his first entry into England as it is also stated that he had “left from London in March last”. (1) And indeed, we do find a Jean-Baptiste Reynauld as early as 1827 in the records of the Fire Office as “silk mercer and linen draper” in 2 Beak Street off Regent Street. Subsequent entries show him in 1831 in 53 Lower Brook Street off Grosvenor Square as “silk mercer, embroiderer and jeweller” and from June 1836 in 14 New Bond Street, again as “silk mercer, embroiderer and jeweller”. 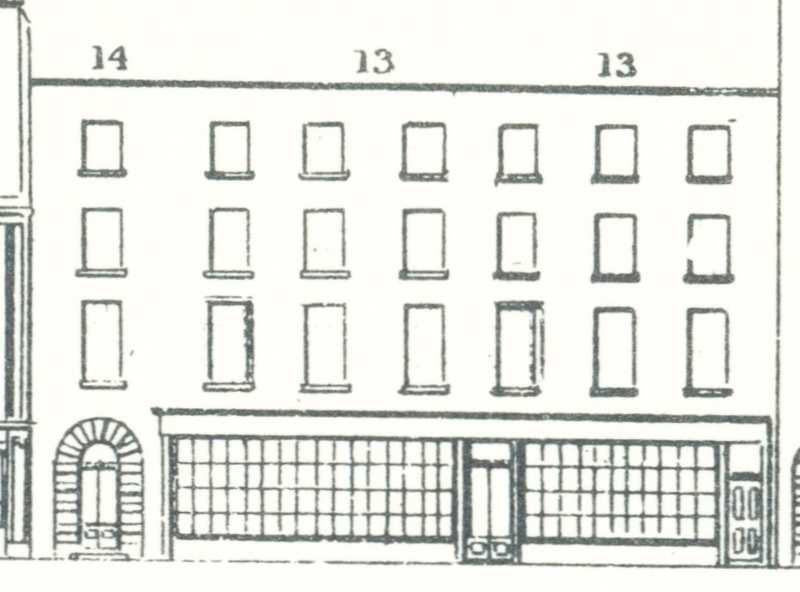 (2) As you can see from the elevation, 14 New Bond Street appears to be a very moderate establishment, but as we will see later in the story, the space above the shops at number 13 also belonged to Reynauld. 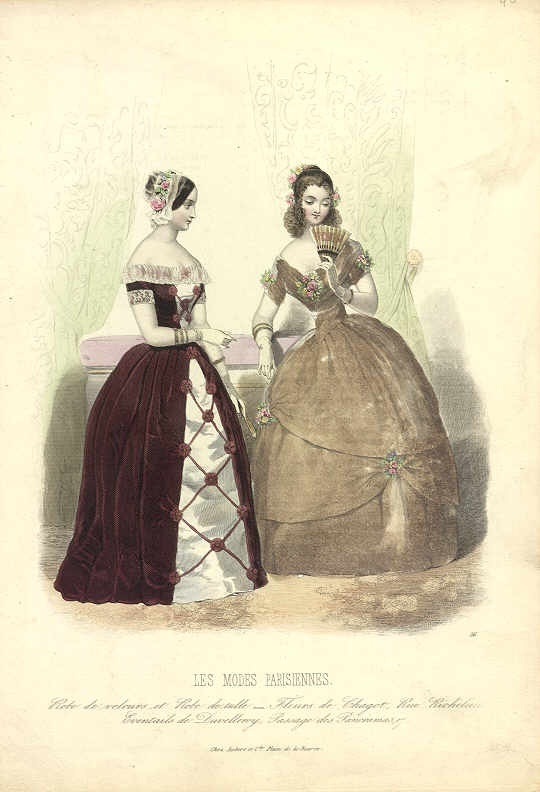 His trip to France in 1837 for which we have the arrival certificate was probably not his last, as in May 1839 he advertises new dresses from Paris which have arrived in time for the celebration of the Queen’s birthday. We can probably assume that he went over to France to buy the dresses himself, although records do not show us that he did indeed go himself. He may have used agents, or received them on spec from his French suppliers, but that is not certain. The dresses probably looked something like the ones shown here. An advertisement in The Morning Post alerts us to the fact that Reynauld did more than sell silk. He was apparently also the agent, or at least the corresponding address for French institutions, such as the Institute for Young Ladies in Paris. 505 yards of lace, value 112l. ; 30 lappets, value 32l. ; 14 veils, value 20l. ; 12 sleeves, value 8l. ; 18 spoons, value 6l. ; 1 pair of sugar tongs, value 1l. ; 3 studs, value 16s. ; 1 watch, value 4l. ; 2 coats, value 3l. ; 1 cravat, value 6s. ; 1 waistcoat, value 12s. ; 1 pair of trowsers [sic], value 15s. ; 2 pencil cases, value 12l. ; 2 knives, value 2s. ; 1 pair of spoons, value 4s. ; 1 head ornament, value 30l. ; 1 bracelet, value 20l. ; 2 brooches, value 60l. ; 1 opera-glass, value 2l. 10s. ; 1 purse, value 5s. ; 23 sovereigns, 10 half-sovereigns, 100 shillings, 16 sixpences, 1 £40 Bank-notes, 5 £10 Bank-notes, and 6 £5 Bank-notes. He may have been insured, but not long after the fire, Reynauld decided to sell up. What became of him and his family is unclear. Perhaps they went back to France. (1) Alien Arrivals, 1810-1811, 1826-1869. Class: HO 2; Piece: 23; Certificate Number: 1168. (2) National Archives, Records of Sun Fire Office MS 11936/516/1065576 28 September 1827; MS 11936/522/1096193 11 September 1829; MS 11936/533/1130316 28 October 1831; MS 11936/539/1163634 4 December 1833; MS 11936/550/1211708 28 January 1836; MS 11936/553/1224157 1 June 1836. (3) Old Bailey Proceedings Online, July 1839, trial of Frederick Syrett William Blake Robert Agar (t18390708-2100). (4) Australian Joint Copying Project. Microfilm Roll 91, Class and Piece Number HO11/12, Page Number 197 and 184 resp.